Today was too hot for human comfort in New York, but the butterflies seemed undaunted. 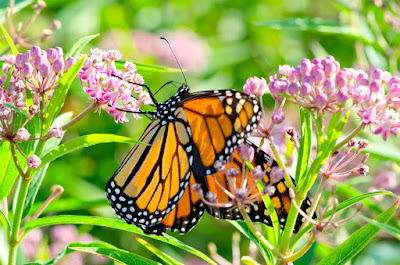 There were several monarchs like the one above in the wildflower meadow on Pier 6 in Brooklyn Bridge Park. They reminded me of the famous butterfly dream of the Chinese philosopher Chuang-Tzu, which I've quoted below. "Once upon a time, I dreamt I was a butterfly, fluttering hither and thither, to all intents and purposes a butterfly. I was conscious only of my happiness as a butterfly, unaware that I was myself. Soon I awakened, and there I was, veritably myself again. Now I do not know whether I was then a man dreaming I was a butterfly, or whether I am now a butterfly, dreaming I am a man." -Zhuangzi (c.3rd century B.C. ): The Butterfly as Companion: Meditations on the first three chapters of the Chuang-Tzu, by Kuang-Ming Wu (1990). nice shots! how hot was it? where I live it usually gets above 100 degrees Fahrenheit this time of year, but I guess we have dry heat which is better than humidity like back east.